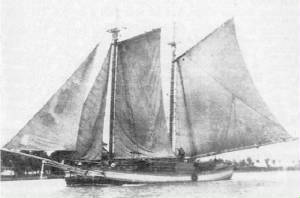 The old schooner Garibaldi was deep laden with 150 tons of coal, under sail on Lake Ontario from Fairhaven, New York, to Toronto, in the midst of a November gale. Captain John McGlenn drove his ship before arctic winds under storm canvass, as ice formed on the sails and ropes, but chose to drop anchor and ride out the gale before attempting to work his way into Weller’s Bay. The Garibaldi was an old wooden schooner, only 103 feet in length, so her crew endured a terrifying 15-hour wait as the storm continued to rage, showing no sign of easing. Then, when the anchor chain parted, the crew had no choice but to attempt to hoist sail and steer their ice-laden vessel through the narrow channel leading into the bay. They didn’t make it. The storm drove the vessel on a bar and there it remained as the relentless waves rolled over her decks. The ship’s lifeboat was so old the storm broke it apart even as the sailors attempted to launch it. With nothing left to be done, crew members climbed into the rigging of their dying ship, lashed themselves to the masts, and waited for rescue or death. The mate, identified as Louis Stonehouse, refused to follow them. He went below deck to wait out the storm there. Waiting out a storm tied to the masts and rigging and exposed to the wind, rain and fury was probably one of the worst fates a sailor could face in the old days of sail. But when the seas were high and the ship was stranded, it was the only chance a man had for survival. When a rescue crew arrived the next day, the men in the rigging were found barely alive, but they were alive. But down below, under a hull caked in layers of ice, they found Stonehouse standing in his cabin, frozen solid. They said his hands were raised high over his head as if trying to ward off something terrible that was coming at him. No one could explain what really happened to Stonehouse that night. His body was a encased in a block of ice, in an upright position. The Geribaldi was salvaged, rebuilt and sailed again after that. The vessel remained on the lakes until it wrecked once more in 1887.